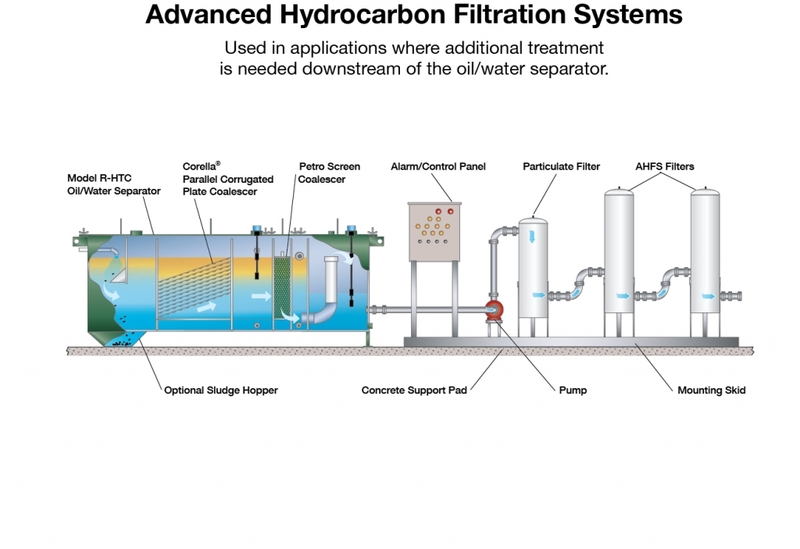 Advanced Hydrocarbon Filtration Systems (AHFS) are used in applications where hydrocarbon removal beyond the capability of a normal oil/water separator is necessary. AHFS provide efficient and cost-effective removal of a variety of hydrocarbons, ranging from BTEX to crude oil, from water. They also help safeguard the environment and personnel from harmful persistent chemicals and pollutants. AHFS employ oleophillic filters that utilize a patented hydrocarbon removal technology that bonds hydrocarbons to the filter media, making them hydrophobic and viscoelastic. This property removes the hydrocarbons from the water stream. The single-pass efficiency through the filter cartridges is very high, with very little pressure drop created by oil saturation. Our custom built AHFS are skid-mounted with filters, pumps, motors, controls, valves, piping and wiring. By designing our AHFS from the ground up, Highland Tank’s engineers can assemble all the components necessary to meet your specific applications.